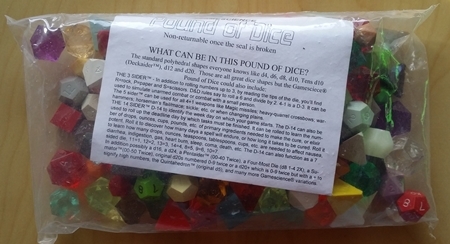 MartinRalya.com & Yore | What do you get in a pound of Gamescience dice? I ordered a pound of dice from Gamescience the hot minute they came back in stock, and I figured I’d break it down here so folks could see what’s in the current assortment. 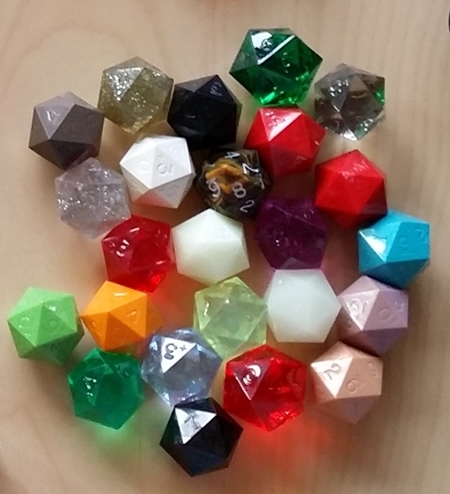 At $55, it’s not cheap — but neither are Gamescience dice in general, and you get a lot of dice which are currently a bit of a pain to find. 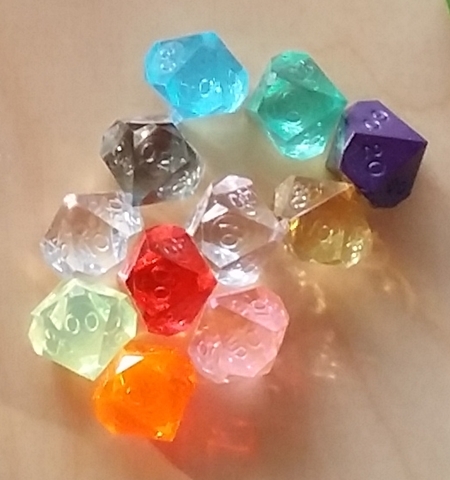 The current run apparently doesn’t include any d6s, which is fine by me. 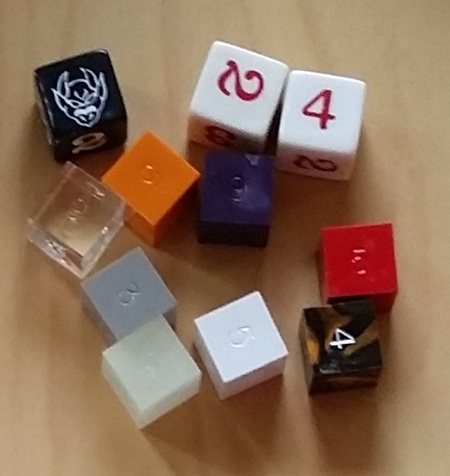 I’m in it for the variety, the surprise factor, and to bulk up my stash of precision-edge dice. I assumed they’d all be uninked (I was wrong! ), but that’s easily remedied and I enjoy inking dice. I use an extra-fine point Sharpie white paint marker when light numbers are best, and an ultra-fine point Sharpie marker when other colors will work (most often black, which turns out nice and bold). So what did I get in my pound of Gamescience goodness? A total of 143 dice, about 43 more than I was expecting! That puts the cost per die at about $0.38, which is insanely low for Gamescience dice. Here they are out of their bag. …And broken into groups of five so I could count them. From here I’ll just go die type by die type, more or less. 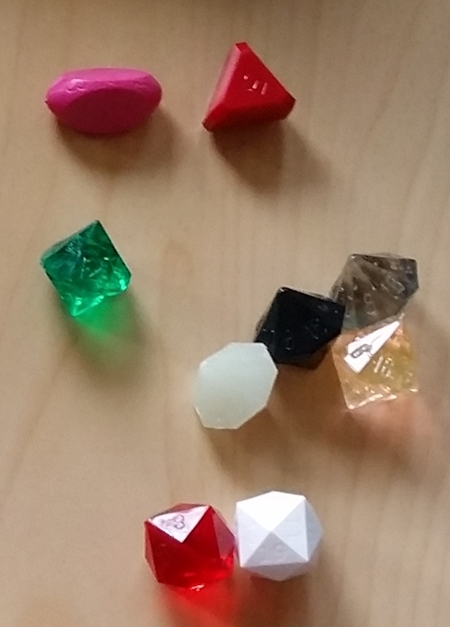 I’m a fan of Gamescience’s distinctive “truncated” d4s, which have flat tips instead of pointed ones. Some great colors in this mix, too. 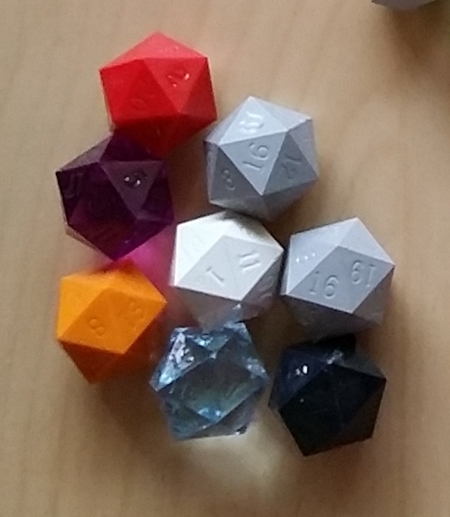 Yep, although the product page said there wouldn’t be any d6s, my bag included some. 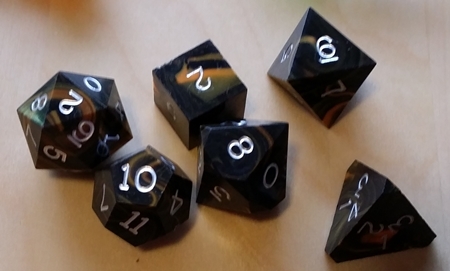 Three are printed dice, without etched/indented numbers — not the usual Gamescience approach, although I know they’ve done some of these over the years. DCC RPG made these popular, and I love funky dice. My mix included 1d3, 1d5, 2d14, 3d16, and 2d24. Check out that oversized blue monster! Oversized dice were one of the surprises in this bag. Okay, not quite one million. Actually 13 — sort of! Here are the 13. 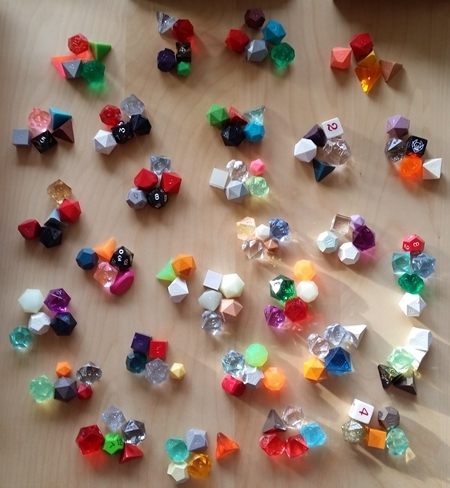 There were 24 old school d10s in my bag — 20-siders numbered 0-9 twice, sometimes with a “+” next to one set of numbers, sometimes not. 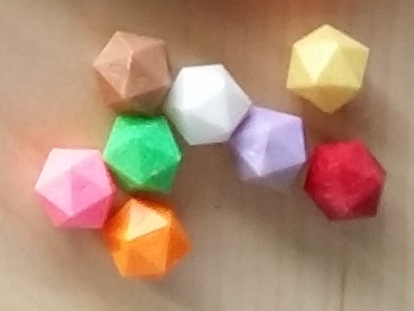 There are also 8 micro dice, all of which are also 20-sided d10s. I got a nice complement of these. 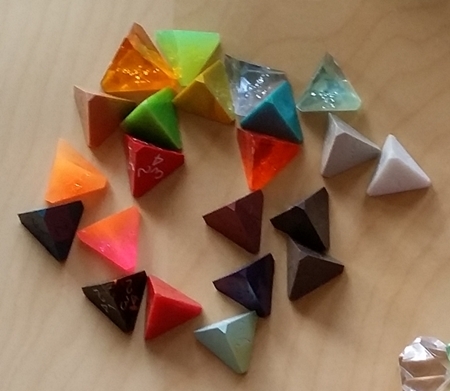 Giving the d10s a run for their money, I got a lot of d12s. I love d12s! 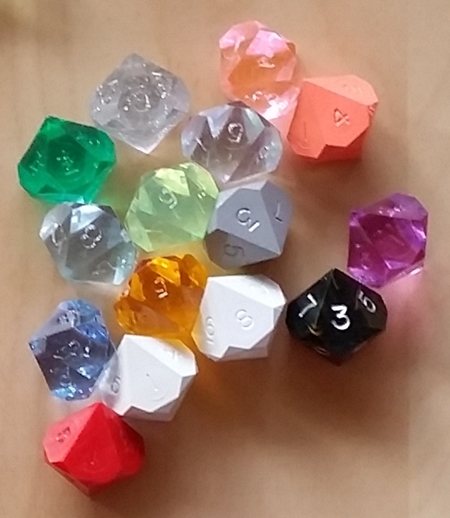 I was expecting a few funky dice, but what I wasn’t expecting were dice I didn’t know Gamescience even made: oversized dice, some low-impact dice I wouldn’t have pegged as Gamescience at all, sparkle/glitter dice (which I love), flourescent green and orange dice, and a couple of blank d10s — no numbers or markings, just the little circles where the numbers would go. 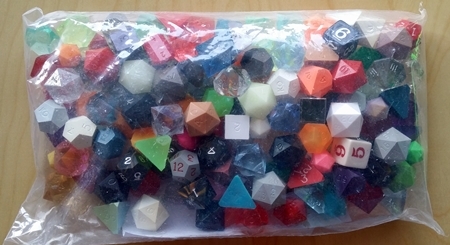 This bag of dice makes me happy. 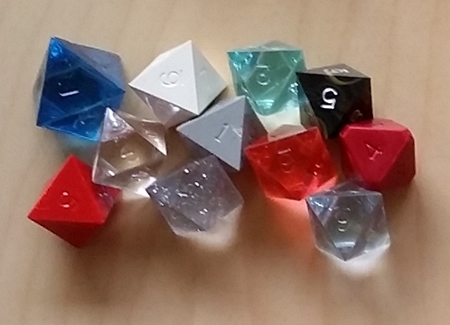 There are some dice in the mix I don’t love, of course, but there are many more I’m looking forward to inking up. There’s a even a complete poly set (minus the d%) in tiger eye, inked in silver — one of the classiest combos I’ve ever seen in Gamescience dice. 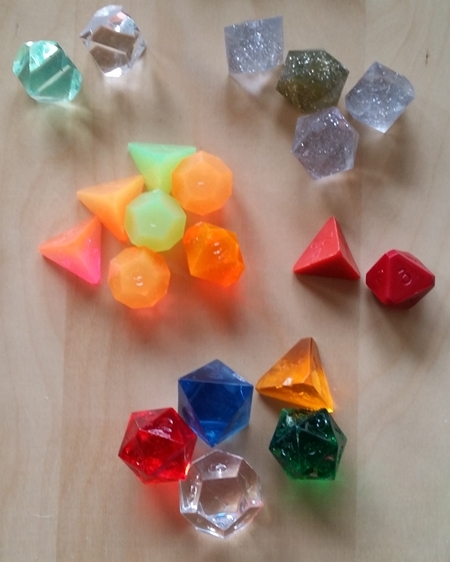 I’ll probably start with the flourescent and glitter dice, and then see what else jumps out at me. Overall, I’m thrilled. 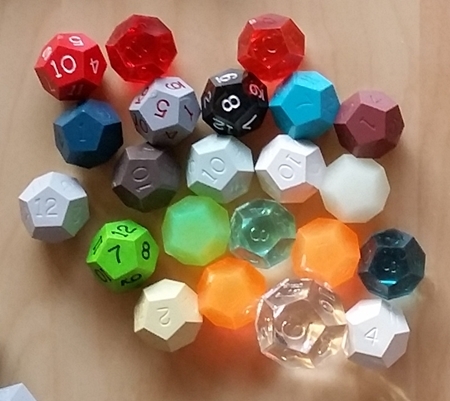 If you’re in the market for some Gamescience dice, snag a pound of dice and see what you get — I bet you’ll dig it. Apparently, they’re not producing d6s at all at the moment. 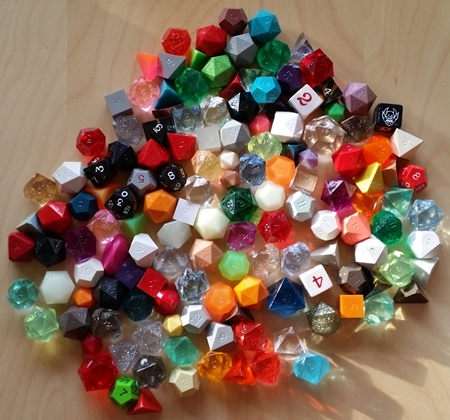 My understanding is that Gamescience licensed their dice, and production, to another company for several years, and only recently reclaimed the license and started producing dice themselves again. Wow! Those are some beautiful dice. Thanks for the breakdown.